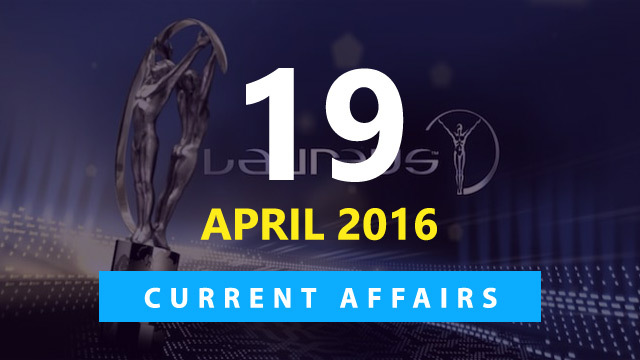 Hi Aspirants, here are the Important Current Affairs Updates for 19 April 2016 covering the important happenings for the day from Current Affairs perspective. --> World No. 1 tennis player Novak Djokovic from Serbia has won the 2016 Laureus Sportsman of the Year Award. He has won it for second time after winning it in 2012. --> US tennis legend Serene Williams has won the 2016 Laureus Sportswoman of the Year Award. It was her fourth Laureus Awards after she won it in 2003, 2007 and 2010. --> The 2016 Laureus World Sports Awards ceremony for the first time was held in Berlin, Germany. The awards are dubbed as Oscar of the sports and are bestowed on sportspersons in different categories. Sportsman of the Year: Novak Djokovic (Tennis), Serbia. Sportswoman of the Year: Serena Williams (Tennis), United States. Team of the Year: New Zealand National Rugby team. Comeback of the Year: Dan Carter (Rugby), New Zealand. Breakthrough of the Year: Jordan Spieth (Golf), United States. Sportsperson of the Year with a Disability: Daniel Dias (Paralympic swimmer), Brazil. Laureus World Sports Lifetime Achievement Award: Niki Lauda (former Formula One racer), Australia. Spirit of Sport Award: Johan Cruyff (Football), Netherlands. --> Inzamam-ul-Haq has been appointed chief selector of Pakistan. --> A former Pakistan captain, Inzamam was the head coach of Afghanistan since October 2015, and was contracted by the Afghanistan Cricket Board until December 2016. --> The PCB, however, requested the ACB that he be released from his contract early. --> Union Minister for Culture and Tourism and Civil Aviation Mahesh Sharma on 18 April 2016 released a Commemorative Coin of 200 rupees and a Circulation Coin of 10 rupees to mark the Martyrdom Day of Tatya Tope. --> Rafael Nadal needed nearly three hours to defeat Gael Monfils 7-5, 5-7, 6-0 and win a record ninth title at the Monte Carlo Masters. --> The Spaniard claimed his first trophy in the Principality since 2012 as he played in his 100th final and tenth in Monte Carlo. --> A cruise missile of the Iskander tactical missile system has been live-fired from the Kapustin Yar practice range in the southern Astrakhan Region as part of drills, the Central Military District’s press office.